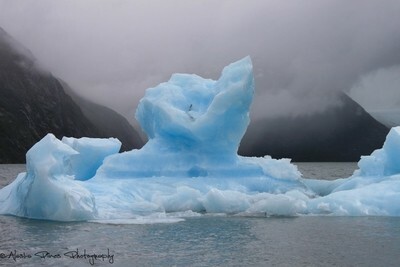 This is an iceberg that came off of the Portage Glacier outside Girdwood, Alaska. You get the brilliant ice blue colors when it's cloudy, rather than on a sunny day. This photo was taken from the Portage Glacier viewing area outside Anchorage Alaska. Luckily we didn't need to take the boat ride up to see the glacier, this chunk of ice came right down to the visitor center. I felt so lucky to have been in the right place at the right time! The Portage Glacier had calved, and this huge chunk of ice was on it's way to the mouth of the river coming off the lake. A common mistake when trying to photograph glaciers and ice is to do it in full daylight. The blue colors of the ice pop more when it's cloudy, overcast or raining. This was taken with my first DSLR, a Canon Rebel T1i with the kit 18-55 lens. Glaciers are always changing, and having such a large piece of ice floating in the lake was unusual, especially for the Portage Glacier. The glacier itself is no longer viewable from the visitor center or parking area, you have to take a boat back around into a cove to see it. It's very sad that the glaciers are melting and changing at such a fast rate! Minimal work was done post-processing. I believe that Mother Nature needs no editing to share its natural splendor. Right now I shoot with a Canon 70D with the Rebel as backup. I've always got my 18-55mm, my 50mm and 100-600mm on hand since you never know what might be around the next corner! Plan ahead! If you know you're going to be out in wet weather, bring whatever you can to keep your gear dry. If it's super sunny, have your hoods ready to block out any unwanted light. Carry enough wipes and cleaning gear to clean lenses, in case of spots or dust.